This model was long ago discontinued. Please see our catalog for newer models. 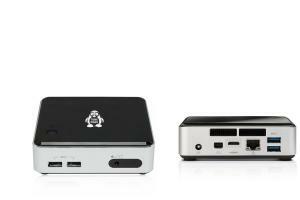 Designed with a 4th generation Intel® Core™ processor, integrated Intel® HD Graphics, and eight-channel audio, the Penguin Pocket Wee gives you the power of a desktop in the palm of your hand, at just 4.6"(W) x 4.4"(D) x 1.4"(H). Whether you're after more desktop real estate or just wanting a small home theater PC that doesn't get in the way we've got what your looking for. International Order? We stock US/Canadian, [censored], [censored], Japan, New Zealand, and Australian AC adapters/plugs. For other countries please inquire. Shipping to most international destinations takes 3-5 business days. Taxes/duties not included. If the configuration you want is not an option below please contact support with your regional requirements. * Lubuntu/Kubuntu/Ubuntu 12.04.4 and 13.10 work 'out of the box', and earlier 12.04 releases work /w the LTS enablement stack installed. The same is applicable to Linux Mint. Version 13 requires the LTS enablement stack. * Compatible with most other recent distributions. Trisquel 6 works with updated linux-libre kernel. While most monitors include a standard VGA, DVI, or HDMI cable newer systems frequently need a mini version of the cable. Check what type of connection your monitor has and get one of the following compatible mini cables. Our AC adapters are compatible with power grids around the world. However each AC adapter needs a cable to connect to your local outlet. Pick the one that is suitable for you. If you have any questions contact support.